On October 28, 2018, State Councilor and Foreign Minister Wang Yi attended in Davao City of the Philippines the opening ceremony of the Chinese Consulate General in Davao and delivered a speech at the ceremony. Secretary of Foreign Affairs Teodoro Locsin Jr. of the Philippines, Vice Mayor of Davao City Bernie Al-ag and others attended the activity together. Wang Yi expressed that the establishment of the Chinese Consulate General in Davao is the inevitable result of the continuous and forward-looking development of China-Philippines relations, and the actual requirement of all-round cooperation between the two countries. China and the Philippines are friendly neighboring countries stretching back through millennia. Since President Rodrigo Duterte took office, the relations between the two countries have been improved in an all-round way, and China-Philippines relations have embarked on a broad road of rapid development. Exchanges and cooperation between local provinces and cities in the Philippines and China have enjoyed vigorous development, and Davao is one of the pioneers and models. Wang Yi said that elaborately governed by President Rodrigo Duterte for years, Davao has enjoyed political stability, social harmony, thriving business and prosperity, which has become one of the most tranquil cities in the Philippines. Since Mayor Sara Duterte took over, she has continuously made great pioneering efforts, propelling the city achieve new construction accomplishments with a broader and brighter prospect. Over the past two years and more, under President Rodrigo Duterte's care and Mayor Sara Duterte's promotion, Davao and China have opened wider doors of cooperation. Davao has become one of the cities with the closest exchanges and cooperation in the Philippines with China. It has already become a sister city with Nanning, provincial capital of Guangxi Zhuang Autonomous Region, China. Mayor Sara Duterte will sign an agreement on establishing friendship with Jinjiang during her visit to China next month to find new friends and cooperative partners for Davao in China. There is also another piece of good news, we have officially opened direct flights from Hong Kong to Davao today, and will also open direct flights from Quanzhou to Davao at the end of the year. It is believed that more and more Chinese tourists will come to Davao to enhance friendship between the two peoples, and will also inject new impetus into the development of Davao and the southern region of the Philippines. 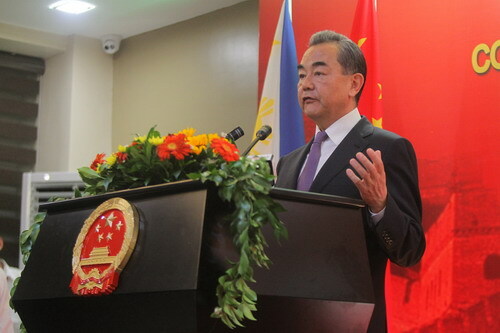 Wang Yi noted that the decision of the Chinese government to set up the Consulate General in Davao speaks of the Chinese side's confidence in the development of the Mindanao region and Davao. We are willing to take the setting up of the Consulate General in Davao as an opportunity to further expand communication and cooperation between Davao and China as well as between the southern region of the Philippines and China. Our goal is to make Davao an important hub for the joint construction of the Belt and Road Initiative between China and the Philippines, a model base for deepening exchanges and cooperation between the two countries, and a leading city for cooperation between China and the East Association of Southeast Asian Nations Growth Area. Wang Yi said that since ancient times, people of China and the Philippines have enjoyed frequent exchanges and shared close bonds. Especially since modern times, many overseas Chinese have come to the southern region of the Philippines including Davao to settle down, live and multiply. They have made positive contributions to the economic and social development of the Philippines, and also become the most determined group in promoting China-Philippines friendly cooperation. The Chinese Consulate General in Davao will not only actively boost communication and cooperation between consulate district and China, but also wholeheartedly well serve the Chinese citizens and overseas Chinese in consulate district, help them solve problems and difficulties, and provide help to make everyone feel at home. In the end, Wang Yi expressed that we stand here today not only for the opening of the Consulate General, but also to declare the firm determination of China and the Philippines to strengthen cooperation and benefit the people. Let us carry forward the "Bayanihan Spirit" (Tagalog, means unity and cooperation) to promote the continuous development of China-Philippines relations together, and to jointly propel the growth of bilateral cooperation with every passing day. 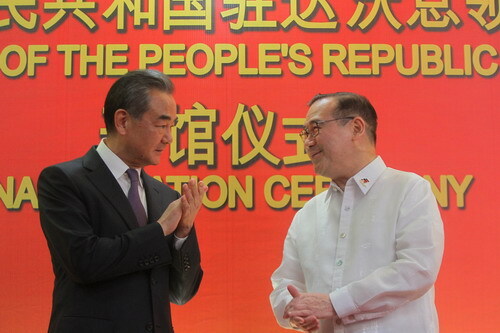 Secretary of Foreign Affairs Teodoro Locsin Jr. warmly congratulated on the opening of the Chinese Consulate General in Davao, and expressed that since the improvement of relations between the Philippines and China, bilateral cooperation in various fields have enjoyed rapid development. The Philippines is always a friend of China. In the past few decades, China has made remarkable achievements which draw the world's attention. The Philippine side looks forward to enhancing all-round cooperation with China. The opening of the Chinese Consulate General in Davao indicates the Philippines, especially Davao, will embrace a better future with China. Vice Mayor Bernie Al-ag delivered a speech on behalf of Mayor Sara Duterte, saying that the opening of the Chinese Consulate General in Davao is a new milestone in the relations between the Philippines and China. It will provide more opportunities and open up new prospects for exchanges and cooperation between the Philippines and China, and will promote the common development and prosperity of the two countries.